Established in the year 2015, Centre for Geography and Geology under the School of Environment and Earth Science offers a post graduate Programme in M.A./M.Sc. Geography, MSc Geology and PhD doctoral Programme in Geography and Geology. The main aim of the center is to enable students at the forefront of education and research internationally and to enhance the experiences and professional development of students. The concept of smart class is highly endorsed in the center where delivery of lectures and teaching using ICT multimedia and green/ white board, use of 3D models, animations, seminar report presentations, surprise test/ quiz, mini projects that involves an extensive field work are basic features of the center. In addition to enhance the potential of student, the Centre has initiated a discussion forum “Central University of Punjab-Geographical and Geological Research Forum”. MA/MSc. Geography course is designed to synthesis both the theoretical and practical geographical knowledge. It provides a platform for promoting the creativity in geographical thoughts, innovation, human values and scientific inquiry in to the physical and human phenomena. The syllabus of the course is designed for the student to enlighten the knowledge on certain branches of geography such as geomorphology, climatology, oceanography, environment, human resource, urban and regional development planning, agriculture, resource, disaster management, GIS (Geographical Information System) and remote sensing. MSc. Geology programme covers a wide range of core courses in geology and allied subject. 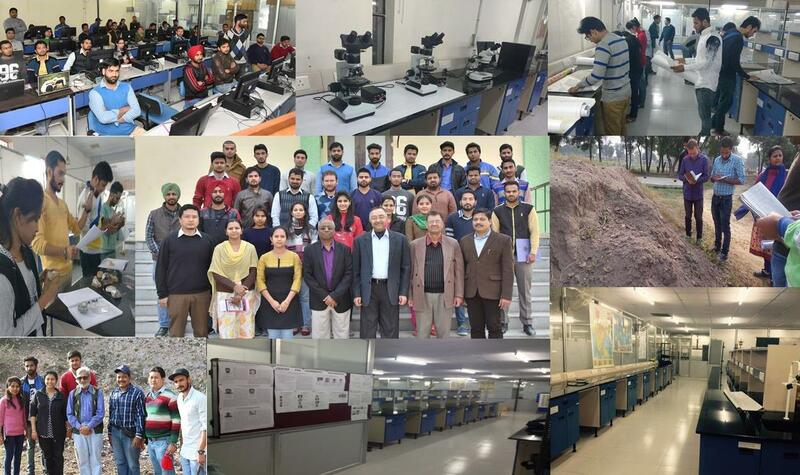 These courses are designed such that the students may get well acquainted with blend of traditional basics of earth sciences with the emerging techniques of geological importance so that the students are equipped with both theoretical knowledges and practical applications of the subjects. It covers the foundation for the study of fundamental geologic methods and problems, both in the laboratory and in the field in different aspects of Geology including the instruction in geomorphology, sedimentology, hydrogeology, geochemistry, stratigraphy, mineralogy, petrology, geostatistics, geophysics, remote sensing, environmental geology, economic geology, geophysical principles and geo-informatics. Now the Centre for Geography and Geology is set to pursue and strengthen research in land use & land cover dynamics, land degradation, urban planning, environment geography, isotope geochemistry, low temperature geochemistry, earth surface processes, applied paleontology, biogeography and vertebrate paleontology. This Centre aims to create a collegial, collaborative and inspiring environment for faculty and students, resilient and well-funded Centre of excellence in emerging areas of Geography and Geology. Departmental projects funded (DST-FIST; UGC-SAP/CAS, DPE; DBT, ICSSR, AICTE, etc. ); Total grants received: 53.4 lacs.